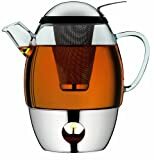 If you're a tea lover like me, check out this cool new SmarTea Teapot With Warmer. 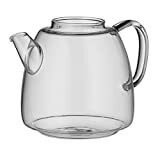 This sleek and modern take on the traditional teapot combines heat-resistant glass and 18/10 stainless steel into one seriously stylish design. The tea can be kept warm between cups by inserting a tealight candle into the warming base and a removable mesh infuser attaches to the lid to let your loose leaf teas slowly unfurl and steep. Beautiful solution. 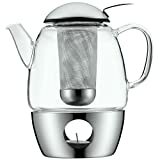 (18 X 24 X 20.8 Cm) - Wmf Smartea 631096030 Teapot Set.